Svart is an inspiring converter and artist. His works can be found an various modeling and painting forums. 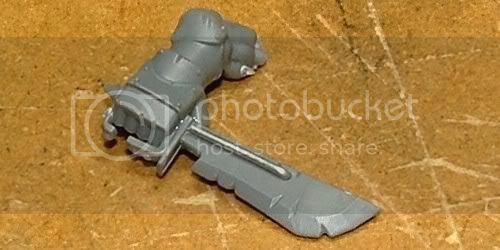 Some of his recent projects include sculpting several items for Secret Weapon Miniatures. Here’s how to make any blade look like a power blade by adding power cabling that runs along the blade and then into it. So go very slowly and carefully, keeping a close eye on the other side of the blade so you know when to stop. I’m leaving these two bits of cabling as they are for now, since this blade was converted purely for the purposes of this tutorial, but on a finished model you’d want to green-stuff in the end of any power line you added so it blends smoothly in with the rest of the weapon’s detail. It’s a simple enough idea, but you have to be very careful with something as fiddly as this. The old adage of ‘measure twice, cut once’ is always a good one to keep in mind when modelling, but especially with this sort of thing – alwaysdry-join pieces to see whether the lengths are right and that things sit properly, in this case paying particular attention to making sure the power line sits flat against the blade when the end piece is inserted into its hole. And there you have it. I simple and effective way to make your own power weapons.